Donald Trump is warning that a Hillary Clinton victory in November would "endanger religious liberty" across America. The Republican presidential nominee said that if Clinton won "religious liberty wouldn't be there" and the result would be "a different country." Trump again vowed to overturn the Johnson Amendment, which prohibits houses of worship advancing specific candidates or political parties. He made the remarks at a visit to the International Christian Academy, a charter school affiliated with the International Church of Las Vegas. He also visited an indoor soccer practice and a 1st grade classroom, where the students greeted him with the gift of a Bible and then recited both the Pledge of Allegiance and an adaption of that called Pledge to the Bible. People screamed as Trump made his way through the Gerald R. Ford Presidential Museum Friday afternoon. He went outside to pay his respects to the late President Ford and his wife Betty. There, hundreds of students and their parents and teachers watched the presidential nominee lay flowers at the gravesite before heading back to the motorcade. A motorcade including the Kent County Sheriff’s Department, Michigan State Police and Secret Service escorted Trump to downtown Grand Rapids. After his visit to the museum and before talking to supporters at the Kent GOP headquarters, Trump hosted a private event at the J.W. Marriott hotel in downtown Grand Rapids that reportedly raised more money for the trump campaign. The unexpected arrival of Trump’s motorcade prompted shrieks of excitement from students at the museum during the annual ArtPrize competition, which brings thousands of people to downtown Grand Rapids each day. Several kids raced across the lawn and through trees for a chance to see the New York real estate mogul and former reality television star. “November 8. November 8,” Trump told visitors inside the museum, where he stopped at several exhibits detailing the life and times of Ford, the 38th U.S. president who grew up in west Michigan. After the museum tour, Trump’s motorcade proceeded to the nearby J.W. Marriott hotel, where a group of influential donors gathered for a pricey fundraiser luncheon. Today after meeting with the Polish American Congress in Chicago, Donald J. Trump is pleased to announce his Polish American Advisory Council. The women and men on the council are grassroots leaders who will engage with the Polish community on relevant issues. “I am proud to have the support of the hard working Polish American community that shares the American values of love of freedom, independence and respect for family. This council will continue to advise me on how best to maintain and increase the strong ties between Poland and the United States,”Of 28 NATO members, Poland is one of only five countries fulfilling Mr. Trump’s call for balancing NATO’s budget by meeting the goal of 2% of GDP for defense spending. It is peace through strength.". 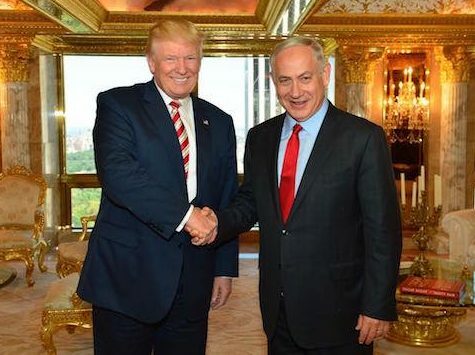 The Trump campaign touted a successful meeting between the Republican presidential nominee and Israeli Prime Minister Benjamin Netanyahu at Trump Tower, saying the two affirmed the “unbreakable bond between the two countries” while discussing Muslim terrorism and stability in the Middle East. “Mr. Trump agreed that the military assistance provided to Israel and missile defense cooperation with Israel are an excellent investment for America. Mr. Trump said that under a Trump administration, there will be extraordinary strategic, technological, military and intelligence cooperation between the two countries,” the campaign said in a statement. “Mr. Trump recognized Israel as a vital partner of the United States in the global war against radical Islamic terrorism.” Trump and Netanyahu also discussed Israel’s border security and the methods it uses to repel and expel invaders, particularly its border fence. Donald Trump met with business leaders at a Dayton manufacturing company on Wednesday, denouncing trade deals as disastrous and saying China in particular has unfair trade practices. “It’s a one-way street. We’re going to change that,” Trump briefly toured the plant and then spoke with 17 local business owners or executives at a round table. Trump said taxes are too high and regulations too onerous. “The regulations are putting businesses out of business,” said Trump. “We are going to be cutting massively.” One man suggested that a larger percentage of military weapons and other goods should be required to be manufactured in U.S. “I like that idea,” It is Trump’s fifth visit to the Dayton region since he launched his campaign more than a year ago. Trump’s swing through Ohio comes as the polls show him with a lead over Democratic nominee Hillary Clinton in the state. Trump and vice presidential candidate Mike Pence took part in a discussion with pastors at the sanctuary of New Spirit Revival Center in Cleveland Heights around 9 a.m. Don King spoke as well. “I want to thank the African American community because, I don't know if you've been watching, but the poll numbers are going like a rocket ship,” Trump said. “I fully understand the African American community has suffered from discrimination." “It breaks my heart to see any American left behind or to see a city like Cleveland that has had so many struggles, and that there are many wrongs that still must be made right,” Trump said. The church’s pastor, Dr. Darrell Scott, said the event was moved to Cleveland from Columbus on Sunday to provide adequate space for the taping of the Fox News town hall. Scott is a long-time Trump supporter and friend who delivered a passionate speech at the Republican National Convention in July. Mike Pence's motorcade pulled up to Battleship Wisconsin Tuesday afternoon where Pence hosted a veterans roundtable on board the ship. "Donald Trump laid out a plan. We are going to reform the VA," Pence said. During the roundtable discussion portion of the visit, Chuck Smith who is a candidate for Virginia Attorney General referred to transgender people who serve in the military as a "social experiment." When WVEC asked about the comment, Pence said, "I think Donald Trump and I are both committed to a military that uses common sense and focuses on the mission. I mean, society will always be changing, but our military has to stay focused. We have to put unit cohesion and military readiness first." The vice presidential nominee made a campaign stop in Williamsburg hours later where he held a rally outside The Capitol Building in Colonial Williamsburg. Donald Trump’s campaign is saying the Republican nominee told Egypt’s president that he has “high regard for peace-loving Muslims.” Trump met Monday night with Egyptian President Abdel Fattah el-Sissi at the United Nations General Assembly. Trump promised El-Sissi that, were he to be elected, the United States would be “a loyal friend” to Egypt, according to a readout of the meeting provided by the Republican’s campaign. He also said they shared a “common enemy” when fighting “radical Islamic terrorism.” The summary of the meeting makes no mention of whether Trump discussed his plan to temporarily ban Muslim immigrants from entering the United States. Trump has also proposed banning immigration from countries affected by terrorism. It is not clear if Egypt is included on that list.